No matter what your POV on using Instagram (and social media in general) to document every milestone in our lives, the truth is more and more weddings are adopting the use of an event hashtag. After a few hours’ research that quickly turned into FOMO, we realised this might just be the most genius tool ever for brides-to-be wanting style inspiration. Say peace out to Pinterest boards, and get ready to hate-scroll. Below, we present to you seven of the most decadent weddings filtered on Instagram by personalised hashtag. 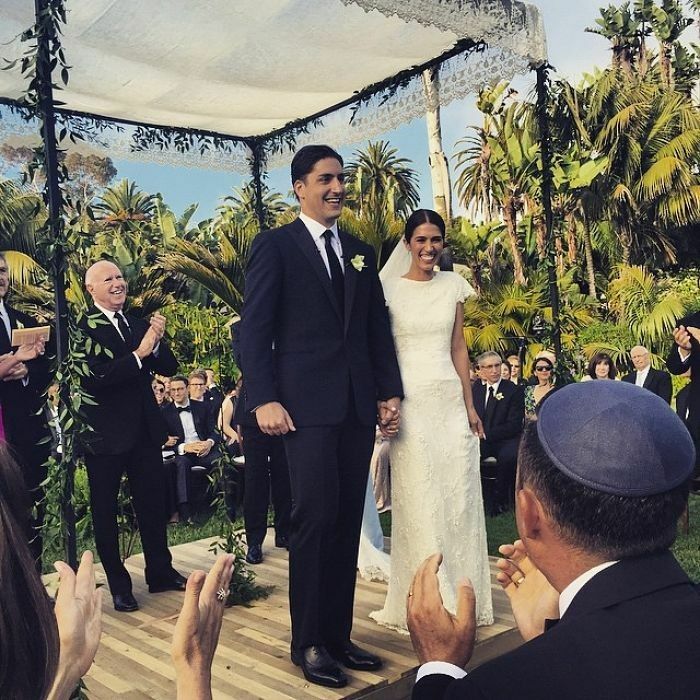 Brittany Weinstein, head of special projects at Goop, and real estate investor Justin Pattner married in Santa Barbara, California. Antonio Berardi custom-made both Weinstein's dress and veil. Elizabeth Cordry donned Oscar de la Renta in her wedding to Charlie Shaffer, the son of Anna Wintour. The Shaffer ceremony took place on Mast Beach, Long Island. Formerly the social strategist at Chanel, Katalina Sharkey de Solis met her designer husband (who also happens to be Prince Charles’s second cousin), Ashley Hicks, on Instagram. The UK wedding event was deemed “the Instagram wedding of the summer” by Town & Country magazine, and the bride wore Fleur du Mal. Socialite Nell Diamond married Teddy Wasserman, of Deutsche Bank, in Southern France. Her wedding dress was designed by Olivier Theyskens and included a 15-foot train. The bride then switched into a stunning Prabal Gurung gown following the ceremony. Jewellery designer Sabine Ghanem tied the knot with financier Joseph Getty in what might be the most lavish ceremony we’ve ever seen. Set in Rome, Italy, the bride wore a dress designed by Elsa Schiaparelli and shoes by Charlotte Olympia. Amanda Weiner, senior accessories editor at Harper’s Bazaar, wed her Israeli entrepreneur boyfriend, Jon Alagem, at the St. Regis at Monarch Beach in California. The bride's dress was designed by the one and only Vera Wang. Being an editor at large at InStyle comes with all sorts of perks. But Kahlana Barfield blew our fashion minds when she admitted to having received a pair of custom Christian Louboutins (from the man himself) AND a custom Vera Wang dress for her wedding. That’s what we call VIP treatment. Model Hilary Rhoda and longtime partner Sean Avery, of New York Rangers fame, finally said “I do.” Rhoda stunned in Carolina Herrera. Michelle Campbell Mason, a jewellery designer, and Zach Vella, a real estate developer, married at Ashford Castle in Ireland. Mason wore custom Maiyet. Always the bride’s guest and never a bride? We feel you. Keep scrolling to shop our four favourite wedding looks. What’s the most creative wedding hashtag you’ve ever seen? Comment below!